Many people live in fear of dealing with litigation because they feel that they have no means of paying for an attorney’s services out of pocket. Lawyers are, after all, expensive. High expense doesn’t always have to be the case, especially if you retain a lawyer that agrees to a contingency fee. Contingency fee lawyers are an excellent avenue to the justice system, but they have restrictions you should know. These attorneys are also called “no win, no fee” lawyers. The primary contingency fee definition is a fee arrangement that allows you to avoid out-of-pocket costs entirely. It is a percentage of the settlement that you receive if you win your case. That’s right; your lawyer only gets paid if you win. It might seem like a high risk for the lawyer, but the reward per case can be considerable. Contingency fees provide the lawyer with an incentive to get you the highest settlement possible as quickly as possible. What is the Standard Contingency Fee for an Attorney? The standard contingency fee for an attorney is a percentage amount rather than a fixed amount. Most personal injury lawyers charge 33 1/3 percent if the case settles without filing a lawsuit and 40% if a lawsuit is filed. Most employment lawyers charge a 40% fee. 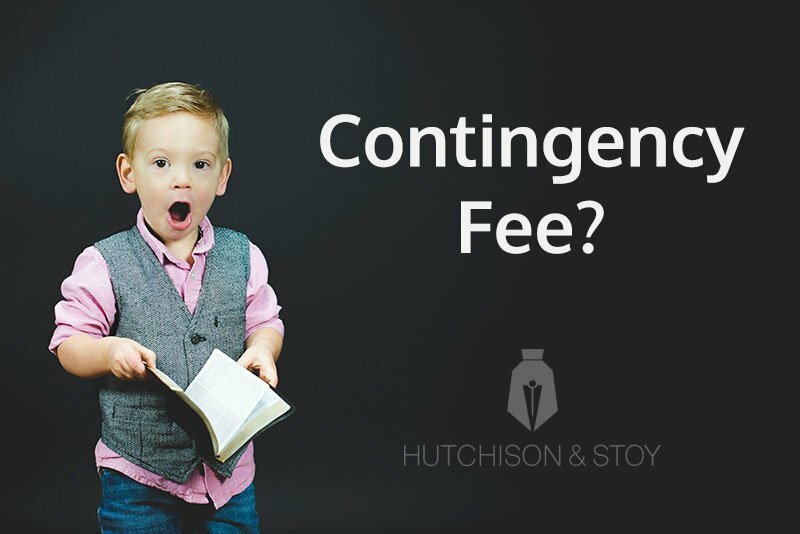 What Types of Lawyers Use Contingency Fee Arrangements? Almost any lawyer can operate under a contingency fee arrangement, depending on his specialty. It is, however, explicitly for civil litigation. Criminal trials do not allow this payment arrangement. No win, no fee personal injury lawyers are the ones most likely to take on a client on a contingent basis. They do this because injury settlements from large corporations or medical malpractice suits can reach prices reaching hundreds of thousands of dollars. For example, $150,000 at a 33 percent contingency fee rate would leave the lawyer with $50,000. The fund comes directly out of your settlement when it is received. Personal injury lawyers aren’t the only ones who work under this arrangement. For example, Fair Debt Collection Practices Act (FDCPA) harassment complaints from debtors to creditors can lead to money recovered to the debtor: the settlement minus the amount of the debt if the debt is legitimate, and the lawyer’s fees. Contingency arrangements for FDCPA complaints aren’t as standard as a personal injury case because the settlements are not as high, but they are possible. Lawyers offer contingency fee arrangements to clients whose cases seem likely to succeed based on their risk assessment and how much work it would take to secure a win. After all, if the lawyer has to pay more money for operational procedures, deposition fees, and other costs than he would receive in profit, it would not be a worthwhile investment of time and resources. It might sound like contingency fees are a good deal, but they aren’t without issues. Not every lawyer will take a case on this basis, especially if it seems like a lot of work or an uncertain win. It can come as a shock to see a lower settlement amount than you are expecting, even if you are aware of the arrangement beforehand. If the lawyer resolves the case too quickly or too slowly, either the client or lawyer may feel they got an unfair portion of the deal. Another concern is that not all areas of law allow lawyers to accept such an agreement. An attorney who agrees to contingency fees in a field that bans them can risk disbarment. The IRS treats monetary settlements as though plaintiffs receive all money from it and independently pay the lawyer. This can cause problems in filing taxes. Make sure you speak with the attorney about any questions you have. Before signing a contingency fee agreement, read through it diligently, especially the fine print. Legal documents are notorious for including information that people miss because they don’t look at the fine print; just look at the Terms of Service for virtually any software. Without a thorough reading, you might miss learning about small fees for which you are responsible and make the lawyer’s work more difficult. As you read the agreement, ask about any terms you don’t understand. The only foolish question is the one not asked. You should also keep a copy of the fee arrangement for your records. There are a few things you’ll want to keep in mind prior to making a decision. Lawyers who accept contingency agreements do not usually charge consultation fees. Before your first meeting, you should determine if this cost exists. During the consultation, you should ask several questions to find out whether the lawyer is suited for your needs. The lawyer who acts as the advertising spokesperson for the firm isn’t always the one who represents you. A junior associate with less experience may receive your case. Despite good intentions, a lawyer with less experience is also less likely to win your case. Ask the lawyer how much experience he or she has with your type of case. Experience enables precedence and knowledge. Don’t rely solely on testimonials because they can be edited or completely fabricated by unscrupulous practices. Are You Prepared for a Trial? Beware of lawyers who promise a quick settlement and don’t acknowledge the possibility of your case going to trial. Although up to 95 percent of cases will settle out of court, some will not. These cases will go to trial before a judge and jury. The presence of an opposing lawyer makes your case less favorable. You need to know that your lawyer can handle the rigors of court against the skill of opposing legal counsel. The lawyer should provide you with a definite time frame by which your casework will begin. Work should start within two weeks of hire, and you should receive regular updates on developments. That being said, it is also your responsibility to check-in on the status of your case. How Involved Will I Be in the Proceedings? This question is a matter of personal taste. Do you want to let your lawyer handle all the details or do you want to be present at significant meetings? Some lawyers may not allow you to be present for anything except the trial should it come to that point. Similarly, educate yourself on the lawyer’s preferred contact etiquette. Does he prefer email or telephone conversations? If he prefers telephone communication, how often is appropriate to call and when? Regular communication is a must in any professional relationship. For example, a lawyer that spends $2,000 on legal expenses and costs and receives a $10,000 contingency fee gets $12,000 total. Take any materials you feel might be relevant to your case. You should take police reports, medical bills, and other paperwork that provides pertinent information. The more you have on hand, the less work your lawyer has to do and the more you may save on legal fees. Make copies of the documents for the lawyer’s office and keep your copies. If you still can’t decide whether the attorney is right for you after the initial consultation, look up information online. Your state bar has basic information about lawyers licensed to practice. It includes information about license, educational/professional background, and any disciplinary measures taken against him. For example, here are the lawyer profiles on the Texas State Bar website for Hutchison & Stoy, PLLC. Sometimes people look for so-called “win/loss” records of attorneys as though they are sports teams. No such clear-cut measure of a lawyer’s performance exists. For one thing, your trial or case is the one that matters, not others. For another, revealing whether a lawyer won or lost a case could create a breach of confidentiality in medical suits. Legal matters are rarely so clear-cut. So How Do I Find a Contingency Lawyer Near Me? If you have a employment, civil, or personal injury case the lawyers at Hutchison & Stoy can provide you with a free case evaluation. Simply fill out the form or call us directly at 817.820.0100 to talk to an attorney about your case. Another way would be to go to the website of your state’s bar association. Navigate to your county or metropolitan area and look over the list of available attorneys. Finally, if you know anyone who has had a similar case to you, ask for the name of his lawyer. Even other attorneys may refer you to someone who can help you purely as a professional courtesy. Getting the legal help you need doesn’t have to break your bank account or cause more stress. By getting a contingency fee lawyer to represent you, the legal system is at your disposal. If you have any questions, don’t hesitate to contact our team. We are here to help you get the justice you deserve!